A comprehensive range of silicone tubing, with many bore sizes meets the demands of practically any application. The smallest tubing manufactured by Viper Performance is most commonly used as electrical sleeving, whilst mid-range sizes are generally used to carry liquids and powders within the food processing and pharmaceutical industries. Viper Performance offers a wide selection of approved silicone extruded tubing for use specifically within hygiene critical applications including FDA, WRAS, Ktw, Bfr and USP Class VI to name but a few. Dielectric tubing and hot air ducting are just two uses for the largest tubes in the range. - A very popular all-rounder, suitable for food contact, peristaltic pumps and hundreds of other applications. Large bore peroxide tubing - 30mm ID and above. 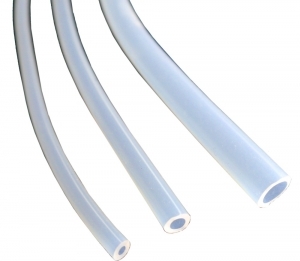 Dairy Tube - With silicone tubing / hoses specifically tailored to meet the demands of the dairy industry.